Egyptian cotton is known for it's luxury and high quality. I purchased the charcoal color for our newly renovated bathroom. It is fabulous and feels amazing on your feet when you step out of the shower. Every thing you expect from 100% Egyptian Cotton, definitely recommend. 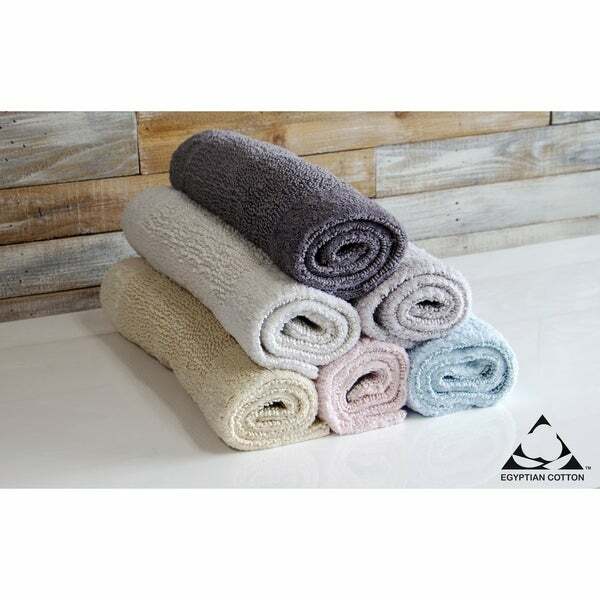 Our Royal Touch bath rug is made from 100% certified Egyptian ring spun cotton. These fine bath rugs are handmade by Egyptian craftsman from the highest quality cotton yarn available. The soil and moist atmosphere of the Nile River Valley, makes the ideal conditions to raise long cotton fibers called staples. Fibers from the Egyptian cotton are substantially longer than regular cotton and with longer staples, the Egyptian cotton has many advantages such as; superior strength, soft and luxurious, unrivaled absorption, and superior colorfastness. The Royal Touch Collection is thick, plush and has a reversible design that feels soft and cozy underfoot. "What color is the natural? Is it off white, ivory or tan/beige?"